Read here about tensegrity and structures that consist of bags containing bars. This is a special case of a membrane tensegrity structure. Gerald de Jong visited Kenneth Snelson on 28 December 2009. 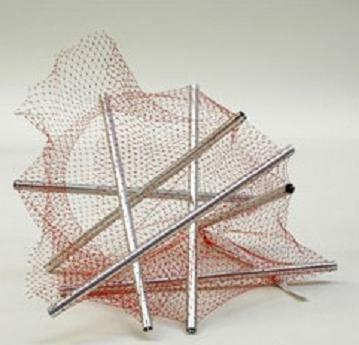 He wrote that Kenneth Snelson "plopped" on the table a "floppy little mesh holding a bunch of tubes." In such structures, the bag supplies the tension that holds the compression struts in place. Unlike conventional tensegrity structures, the tension element is not fashioned securely to the strut. The mesh bag in de jong's photo has six struts. "6 bars in a mesh bag, photo by de Jong." "7 bars in a mesh bag"
This page was last edited on 28 January 2019, at 10:47.